Marriage and family therapists meet with couples and families to resolve problems, alter behavior, and enhance communication. They meet with groups and individuals. Marriage and family therapists utilize various therapies to enhance communication and get family members to constructively deal with disputes. Their main goal is to make sure small problems do not become major ones. 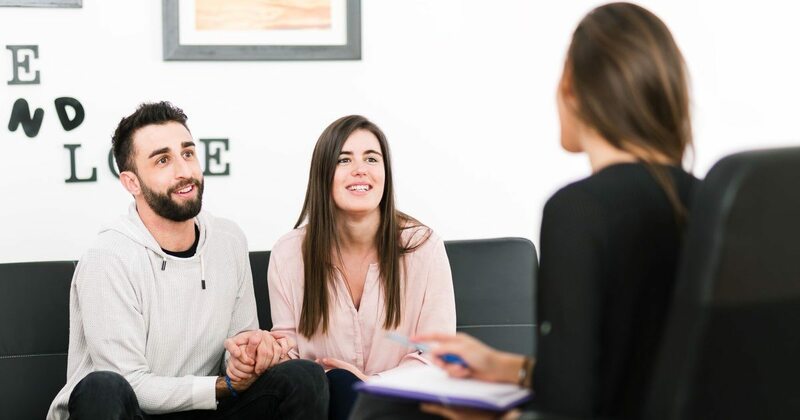 During marriage counseling with couples discussing divorce, therapists attempt to discover underlying problems and determine if the marriage can be saved. Marriage therapists usually interview both people simultaneously during sessions, but occasionally they meet separately with them. These specialists also organize group counseling sessions for multiple couples. Marriage and family therapists frequently work nights and weekends to accommodate patients&apos; work schedules. Marriage counselors employed by state agencies typically meet with patients 2-3 nights each week. Counseling sessions usually last an hour. Family counselors should possess solid communication and interpersonal skills. They also must be empathetic, assertive, and good listeners. The Bureau of Labor Statistics estimates that job growth for marriage and family counselors will increase 30 percent through 2016, a rate higher than average projected growth in other industries. During 2008, average salaries for marriage and family counselors exceeded $44,000 a year. Some of most successful therapists run their own clinics, work at hospitals, or hold supervisory positions at state agencies. Many therapists are employed as directors of large clinics and state agencies. These positions are typically filled by therapists holding PhDs. Many marriage and family therapists teach classes at colleges or universities and organize training seminars for their colleagues. Most states require family therapists to satisfy licensing requirements, which differ by state. Before practicing professionally, marriage and family therapists are usually required to hold a master&apos;s degree, complete 2 years of supervised clinical work and pass an exam. Certain states permit counselors with bachelor&apos;s degrees employed at state agencies to administer therapy. Students enrolled in master&apos;s programs in marriage and family therapy are required to complete courses in family counseling theory, human development, clinical applications, psychology, and counseling.